Luxury NIM Textile SOFITER Collection innovative curtain panels utilize the newest weaving technology to sandwich a dense layer of light blocking, heat absorbing dark threads in between the top and bottom layers of fabric. Unlike competitors who coats the back of the panel with cheap chemical layer which gives the curtain a stiff and unnatural look, our Blackout curtains drape softly and smoothly. The top layer is a heavily weaved fabric giving you a solid and rich feel to the touch. With this window cover, you will block out light and heat without compromising on style! Care instruction: Machine Washable cold water with similar colors, non chlorine bleach, warm iron as needed. I wasn't sure about these when I purchased them because they were meant for a different room. I now use them in my bedroom and I love them. They block more sunlight than anticipated because I have them hung on the outside of my window frame. The silver white color is a good description. They look white and they look faintly baby blue or silver depending on the time of day. So far these have been my favorite curtains I've purchased through Amazon. Perfect for my 120” window! Length is true to description, once material is relaxed. 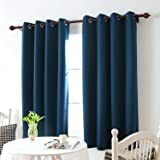 82 1/2” is perfect height of the curtain rod, since there is about 1 1/2” of material above grommets. Extremely pleased. I live in the Midwest and next week we're projected to go to -14 F. I have large windows leading to a balcony. I was hesitant to believe how much cold curtains could block out, but surprisingly it's a lot! I'm inclined to believe that I may even be saving a few bucks on my electric bill. - Good weight to the curtains, but not heavy. - Color is as shown in photos. - Can help block out cold winds coming in through windows. - Does what curtains are supposed to do: block out sunlight and peeping eyes. - Nothing I can think of! 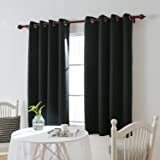 5.0 out of 5 starsWonderful Black Out Curtains! I have sliding glass doors that needed blackout curtains. I was SUPER NERVOUS buying blackout curtains that would be the only thing hanging to block the sun because normally I have window blinds up and curtains over the blinds in the rest of my place for the regular windows and even then it's difficult finding a decent curtain that will block out about 85-90% of light let alone blackout with no blinds. I'm very happy to say these curtains do what they say! These are 100% blackout curtains and the material is lovely. Very nice quality. I'm very pleased. I will update with a photo when I get a chance so you can see how great they are. 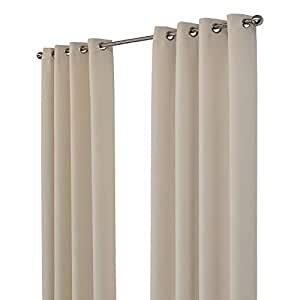 It took me a long time to find these because almost every time I thought I had found *Thee* curtain lol I would look at the photos and see that it was with window blinds behind the curtain which absolutely makes a huge difference in sun blocking efficiency. Look no further, buy these!! They were easy to unpack and hang, also to their credit they are nice to the touch and not stiff. HOWEVER, maybe I am under the wrong impression of how black out curtains work but there is a large amount of light coming through the center whether my blinds are open or closed behind them (see photos) I was going for total blackout so I could get better sleep and this is really disappointing to find out now that I have unpackaged and hung them. If this is normal I have a HUGE problem with them being labled blackout curtains as it's very misleading and I'll be taking action on this. I would steer of this product if you wanted total darkness.